She is known as the mother of psychiatric nursing although her ideas have influenced all fields of nursing. She introduced the concept of the nurse-patient relationship (more groaning!) 60 years ago at a time when patients did not actively participate in their care. Her ground-breaking theroretical and clincal work led to the development of the distinct field of psychiatric nursing. She published her book Interpersonal Relations in Nursing in 1952, although it was completed in 1948 - publication was delayed four years because at the time it was too radical for a nurse to publish without a physician as co-author. Perhaps because of this insulting event, she was the major force in moving nursing from an occupation to a profession and a proponent of advanced education for nurses. She was a member of the faculty of the College of Nursing at Rutgers University and there is our Jersey connection. Rutgers has a unique identity as a colonial college chartered in 1766, a land-grant college, and Ivy League School and a state university. Also, there is no apostrophe in Rutgers. As an influential leader in the American Nurses Association, Peplau urged continuing education and advanced practice for nurses. At Rutgers, she created the first graduate level program for clinical specialists in psychiatric nursing. She was both the president and the executive director of the ANA, an advisor to the World Health Organization, a member of the International Council of Nurses and a fellow of the Academy of Sigma Theta Tau, the honor society of nursing. She also held seven doctoral degrees. Take that, 1948! 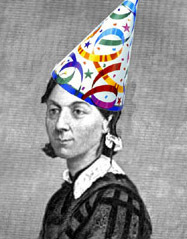 Please join me in giving a big birthday shout out to Florence Nightingale who would have celebrated her 185th today. Who knew Florence could look so good in a hat? It's good to know that she wasn't just a brilliant caregiver, but a genuine party girl. I am looking for graphics .jpg's of Hildegard Peplau for a preentation in my BSN Theories class. If you could let me know where I might find some I would appreciate it. This is why I'm a disgusting pervert for female nurses.